I’ve updated the Optimising Windlight for Avatars tutorial because of the increased Ambient values in version 18.6.76116 (thank you WL team). For me this version produced some beautiful avatar shots for ads; all the recent Muse ads in the last release were shot using this updated preset, changing the East Angle of the sun around in the advanced sky editor and some local lights (either face lamps or ones I set down manually). In my opinion, minus the black bands in the sky and other glitches, it was aesthetically the best release to date; with a little tweaking and some local lights avatars had the added depth and realism similar to characters in many current, high-quality 3D videogame titles. 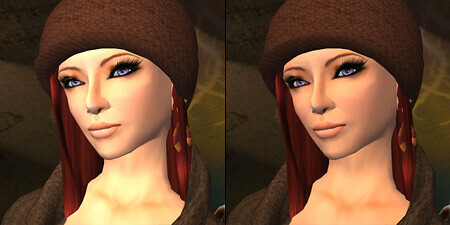 Avatar in WL version 76116, using the Optimising WL for Avs preset, left w/ facelamp, right without. Avatar in version 76116, region default lighting. Under the Client menu (enable the Debug menu with ctrl+alt+D) select Rendering>Types. You’ll see a list of types that your client renders. Turn off the types superfluous to your shopping – Sky, Trees, Water, Clouds, Ground, Particles, Sound, Bump. Most importantly, to cut down on client-side lag disable Character when you’ve reached a spot where you can cam-shop comfortably. You won’t be able to see your avatar, but your client is spared the effort of rendering dozens of other people and their attachments, and you the effort of asking other people to remove their prims. You will have to turn this back on if you need to move around, but the benefit is worth it. A few people have noted some increases in stability with the Windlight client; one of its features that probably helps a great deal is Avatar Impostors. If you move around a bit while shopping having this is indispensable for reducing client lag. For me, using Nicholaz EC-1a with an older WL version 18.6.75762, with graphics settings at their lowest, impostors on and certain rendering types disabled has proven the most stable setup for high-lag, crowded areas. I didn’t crash once at the Last Call sale and I’ve used it for the runway at fashion shows. as these settings are obsolete. Using this preset with my own facelamp (facing the sun/facing away from the sun). Using this preset without a facelamp. 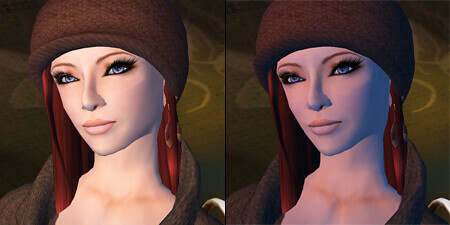 Default Windlight presets (Noon, Sunrise). Note the lines that “age” an avatar. 1) Open World > Environment Settings > Environment Editor. 2) Click on Advanced Sky. 4) Click on the Clouds tab. Set Cloud Coverage to something low, like 0-0.20. 5) Click on the Lighting tab. Under Ambient, raise I (intensity). I recommend using 0.35-045, with the lower values for those who use facelamps; raise higher if needed. 6) Look for the Sun Glow setting. Raise Size to 1.99 (the maximum). 7) Click on the Atmosphere tab. You need to look at the values for Haze Horizon and Haze Density (read on what they do by clicking on the “?” beside each). 8) Have your avatar face the direction of the sun, then fiddle with the settings. I set my Haze Horizon somewhere between 0.15-0.40 depending on how bright I want my horizon, and my Haze Density is 1.00-4.00 depending on how bright I want the day or how clear I want my surroundings. Look at your avatar’s face while adjusting the sliders so you can judge which setting works best for you. Remember to turn in all directions so you can see how it looks when you face away from the sun. 9) You can change the direction the sunlight is coming from by changing East Angle. The Blizzard default is 0.00; try experimenting with what setting you prefer. This is particularly useful for photography. 10) Save your preset, then make any other adjustments you may want to make. If the lighting is a little dark for your taste overall, try clicking on Lighting then raising either Ambient Intensity (I) or Scene Gamma a fraction. 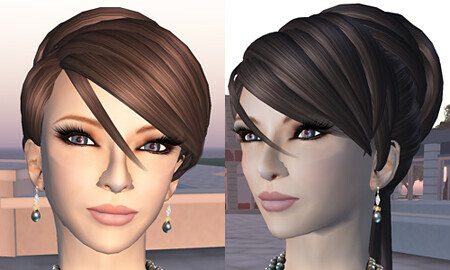 I’m aware this isn’t perfect – it may cause the landscape to look a little dim, some of the lines on your face may not be ironed out, but this is a good all-around preset for when you’re just exploring or shopping and want to look your best with Windlight. Hope you find this useful! 1/13/2008: I’ve adjusted the values for Ambient (as per version 18.6.76116 which you may download here and useable only with a third-party client such as Nicholaz) and added a step for East Angle. I am supporting vers. 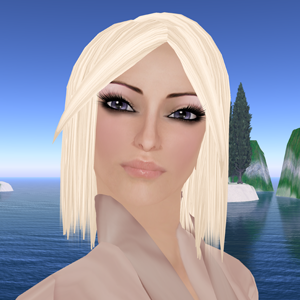 76116 in this tutorial because the current version, 18.6.76886, has local lighting with effects on avatars similar to the default viewer. If you’d like to just download the preset, you may download it here. Unzip these to C:/Program Files/Secondlifewindlight/app_settings/windlight/skies, and rename it from AvatarOpt to whatever you like before starting up SL. When you look in your presets it should be there. 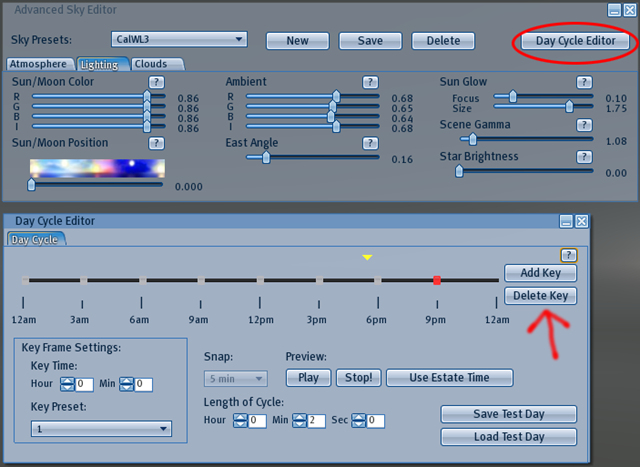 Adjust the Ambient Intensity and East Angle value in the Lighting tab as needed. Enjoy!